The 5th Perinatal Hospital Leadership Summit was held on Thursday, May 25, 2017, in Duluth, Minnesota. To see the final event announcement, click here. The 4th Perinatal Hospital Leadership Summit brought together more than 170 maternity center leaders from 50 Minnesota hospitals to hear about strategies to increase exclusive breastmilk feeding. The Summit was held May 19, 2016 at Earle Browne Heritage Center in Brooklyn Center. Dr. Jesse Hennum, hospitalist physician from Allina Health, started off the morning. He discussed the physiology of human milk and how it has important biological properties that cannot be replicated by artificial milk. He also reviewed the impact of human milk on infant and maternal health, and how marketing of formula can undermine maternal confidence and lead to early weaning. Dr. Jane Morton, pediatrician from Stanford University, presented evidence-based research on early hand expression in the first hour after birth to maximize milk production. She emphasized the importance of skin-to-skin contact during the first hour for both vaginal and cesarean section deliveries to allow early attachment and hand expression when mother’s early milk is plentiful. She recommended teaching hand expression to a mother in the first hour to help build the foundation for her milk supply. In her afternoon session, Dr. Morton described a lactation support strategy for low-risk and high-risk mother-baby dyads. She outlined a mnemonic for a practical approach depending on risk factors of mother and baby: “ABC,” Attachment, Breastmilk production, and Calories for low-risk dyads and “CBA,” Calories, Breastmilk production, and Attachment for those who are high-risk (gestational diabetes, late preterm, etc.). For high-risk dyads, Dr. Morton encouraged early feeds using mother’s own colostrum fed to her baby via spoon. She stressed “keeping it simple” by teaching hand expression and spoon feeding, while involving the help of father/partner. The Summit also included a panel presentation about how pasteurized human donor milk can help increase exclusive breastmilk feeding in hospitals. Dr. Nancy Fahim, neonatologist from the University of Minnesota, discussed how human donor milk use can prevent neonatal complications such as necrotizing enterocolitis. She outlined how health care costs are reduced for premature babies in the NICU when donor milk is used instead of formula. Nurse leaders and lactation consultants from North Memorial and Methodist Hospitals shared their experiences starting donor milk programs, from getting administration on board to establishing donor milk collection depots to the practical aspects of implementing a clinical donor milk program at their sites. A donor milk toolkit has been developed to assist hospitals in the implementation of a donor milk program. It contains sample templates for patient education, policies, procedures, inventory management and other resources. The toolkit is a joint project of Minnesota Breastfeeding Coalition and Breast Milk for Babies and was introduced at the Summit. It is available on the Minnesota Breastfeeding Coalition website here. Another panel discussion included presentations from four hospitals, with nurse and physician leaders sharing their experience with the successes and challenges of becoming Baby-Friendly certified and sustaining the changes. They described early resistance to the changes, but once staff saw the difference in outcomes and patient satisfaction they realized their efforts were worth the work. Dr. Ed Ehlinger, Commissioner of the Minnesota Department of Health, shared how breastfeeding support advances health equity. Using Minnesota WIC and national data, Dr. Ehlinger showed how early supplementation practices vary by race and ethnicity and how the Baby-Friendly Ten Steps can reduce racial disparity in breastfeeding rates. Overall the 4th Perinatal Hospital Leadership Summit was a wonderful day of storytelling, collaboration and inspiration about ways to increase breastmilk feeding in hospitals throughout the state of Minnesota! Maternity center representatives attending the 3rd Hospital Summit are eligible to apply for the MBC and March of Dimes Beginning Baby-Friendly request for proposals. See grant proposal for more details. Past recipients include Mercy Hospital, Moose Lake and St. Luke’s Hospital in Duluth. 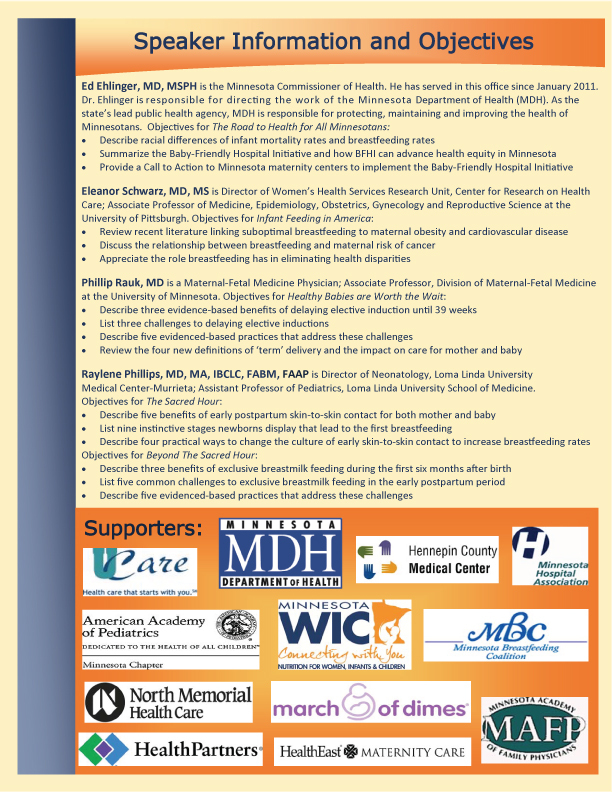 The 2nd annual Minnesota Perinatal Hospital Leadership Summit will bring together hospital leaders from around the state to learn about best practice mother-baby health care to support breastfeeding. 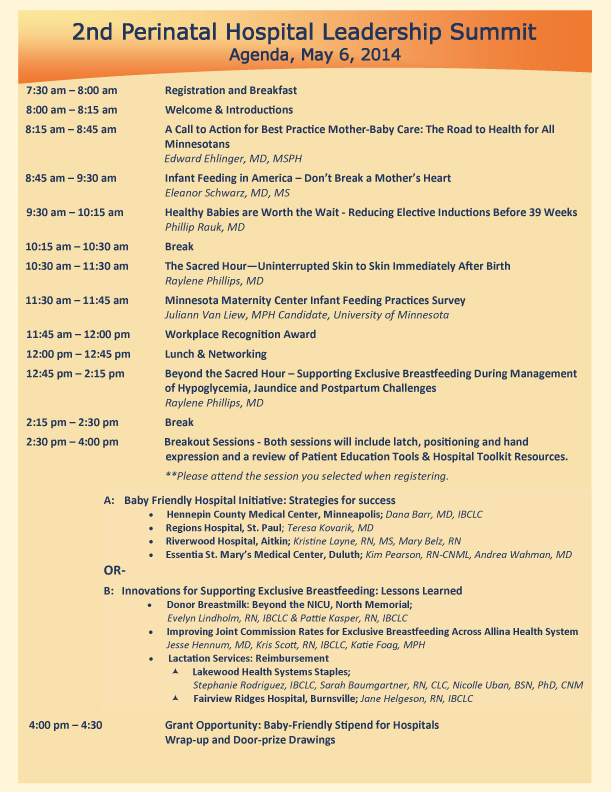 Hear from experts in their field about infant and maternal benefits of breastfeeding, strategies for quality improvement in mother-baby care and evidence-based practices to reduce early elective inductions. Learning from local hospitals about their efforts to implement best practice in their institutions. Connecting and networking with other Newborn and Maternity Care leaders in Minnesota while continuing to work to improve health outcomes for mothers and babies. 2ND PERINATAL HOSPITAL LEADERSHIP SUMMIT: Implementing Best Practice Mother-Baby Care. To conserve resources, we are providing presenters’ slides on the website unless otherwise noted. If you would like a paper copy of the speakers’ presentations, click on the links to download and print. If you have a computer with you, wireless internet will be available to access the Minnesota Breastfeeding Coalition site. Additional slides and handouts will be posted as they become available. Paper copy of Agenda and Sponsors provided at the event. The Hospital Breastfeeding Toolkit is a list of resources for birthing hospitals interested in improving patient outcomes through enhanced lactation support. *Invitations were mailed March 15. Online registration is now open for the May 7, 2013 Perinatal Hospital Leadership Summit. Click here Hospital Summit Brochure to access the brochure with agenda and the links to register online.